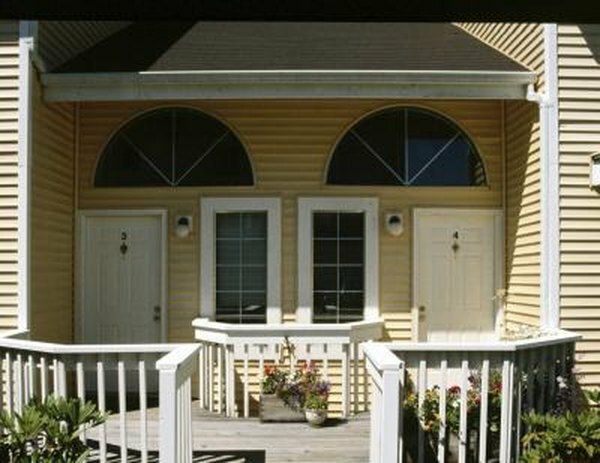 Duplexes offer many potential write-offs. When you report on the income and expenses from your duplex, the IRS requires you to include every penny of income that you receive. This includes your rent, as well as any ancillary income items like application fees, retained security deposits or anything else. The income from your duplex gets reported on line 3 of the Schedule E form. When you rent out a duplex, the IRS lets you claim all of your operating costs as expenses. These include your mortgage interest, your property taxes, utilities that you pay for your tenants, repairs that you make for them, management fees and third-party services that you provide, such as lawn maintenance or snow removal. You can also write off a portion of the property's purchase price every year through a process known as depreciation. This further reduces your taxable income. You report these expenses on the Schedule E form. After filling in all of your expenses on lines 5 through 19, you total them up on line 20. On line 21, you subtract them from your rental income to find your final taxable profit -- or your loss. When you live in one-half of the duplex and you rent the other half out, the IRS effectively treats it as two separate properties. You can write off half of your mortgage interest and half of your property tax as itemized deductions on your Schedule A for the half of the property that you occupy. The duplex half gets treated as a rental property where you report your income and expenses on your Schedule E. You can write off half of any expense that benefits the rental unit on Schedule E. This means that if you provide cable TV service for both units, you can claim half of the bill as a rental expense on Schedule E. This also applies to repairs and services that benefit both sides of the property. If you end up with a loss on your Schedule E, the IRS classifies this as a "passive activity loss" -- or PAL for short. Depending on your circumstances, you may be able to use them to offset other income. To use up to $25,000 a year of PAL to reduce your taxable income, you must have an adjusted gross income of $100,000 or less. If your income is over this threshold, your ability to use a PAL to offset income will go down by $1 for every $2 in income, meaning that it completely phases out when your AGI is above $150,000.